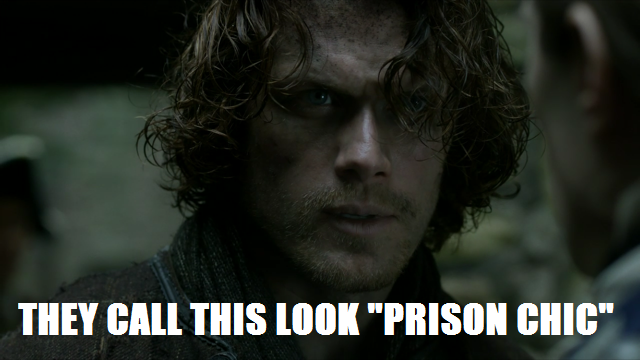 Just when you think Jamie Fraser can’t get any hotter, he has to go be all rough and stoic in prison. 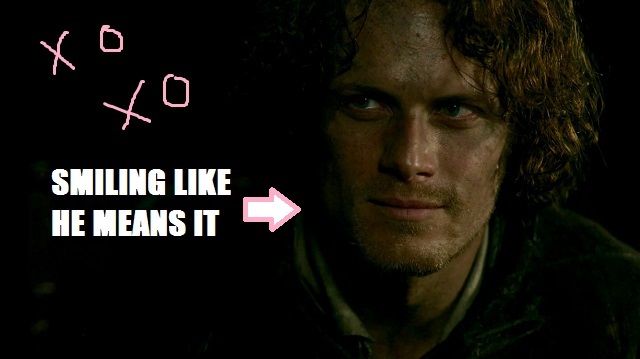 Mac Dubh has arrived, y’all, and so has our latest round of Outlander Superlatives! So many amazing and awful things happen in “All Debts Paid.” Someone dies! Someone lives! 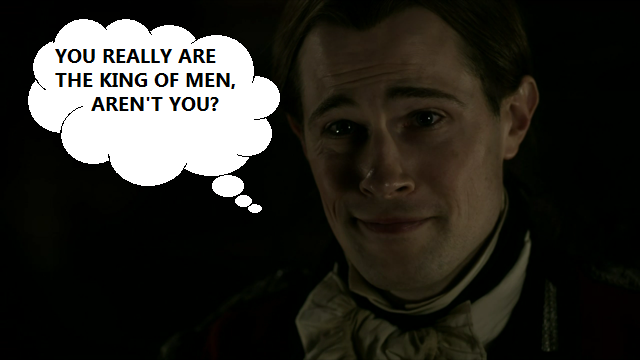 Lord John Grey is in the hizzy!!! Brianna has a birthday!! This may not seem like a really big deal in the grand scheme of things, but since this episode aired on my birthday, I like to think that Bree and I are now birthday twins. Just go with it, okay? 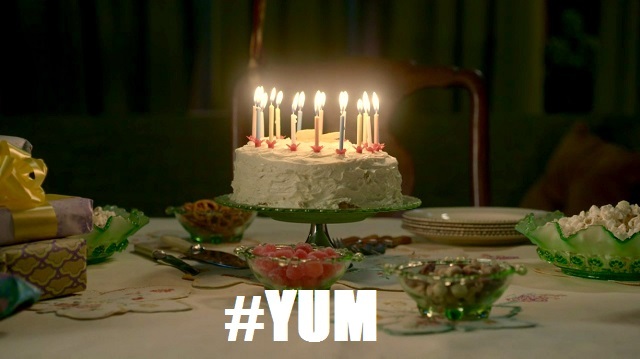 My cake was delicious and I bet hers was too. All right, friends. Let’s tuck into our pheasant and get on with it. Here’s the best of the best from episode 303. Guys! There ARE good redcoats! 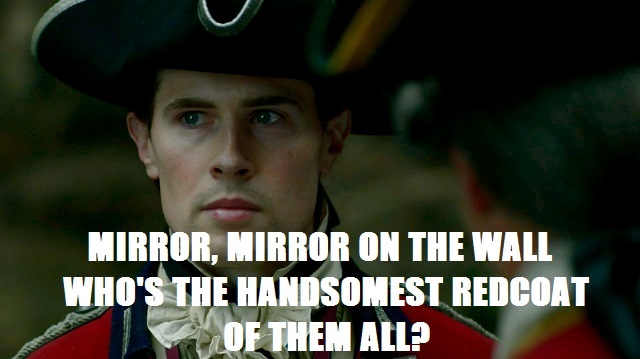 Yes, I know, we had Lieutenant Jeremy Foster way back when, and he seemed all right and all, but this is LORD JOHN GREY! He’s the reason Jamie didn’t get executed after Culloden! 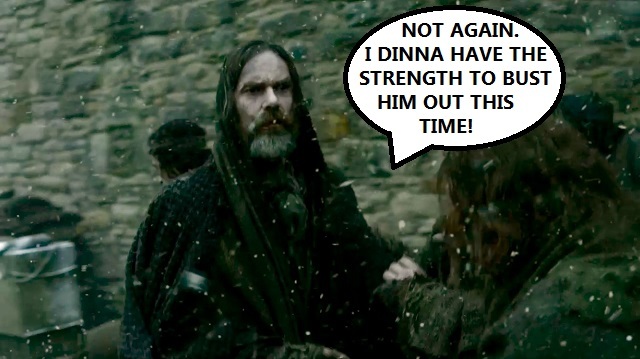 He’s the reason Jamie is kind of sort of getting parole! He’s the reason Jamie gets to have that delicious pheasant in wine sauce! He’s the reason I’m using so many exclamation points! Honestly, this guy is da bomb. Not only is he super handsome, he’s also crazy good at chess, and he’s fair, and he has perfect posture, and he’s also SUPER HANDSOME. Plus, he looks like he could really solve a mystery. Someone give him his own series! 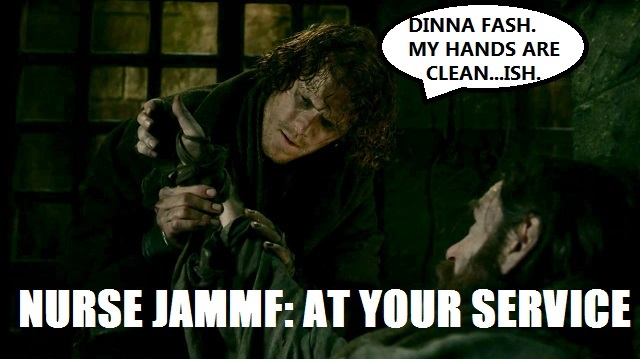 Jamie drops so much medical knowledge in this episode, and I have to say that Nurse JAMMF might be one of my favorite JAMMFs of all. 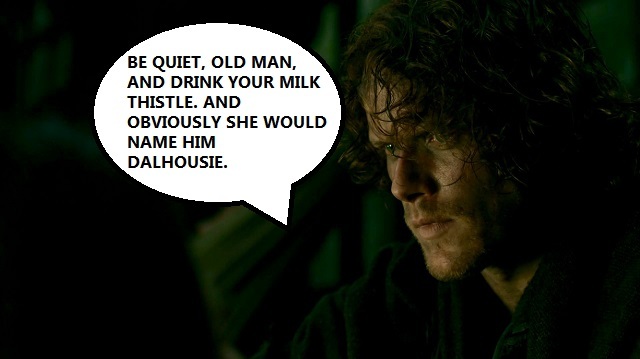 Between checking Murtaugh’s rat bite, mashing him up some milk thistle, and asking for leafy greens so the men don’t get scurvy, JAMMF should be well on his way to becoming an RN. Maybe the boys can all chip in and get him a stethoscope or a fancy medical bag for Christmas. I mean, it doesn’t seem likely since they’re prisoners dining on rats, but you never know. Best Special Guest Stars: The Cast of Who’s Afraid of Virginia Woolf? I didn’t know Elizabeth Taylor and Richard Burton were going to be in this episode! All they need now is a naïve young couple to come over for a dinner party so their drunken antics can be on full display. MURTAUGH FITZGIBBONS FRASER IS ALIVE! It’s an Ardsmuir miracle! 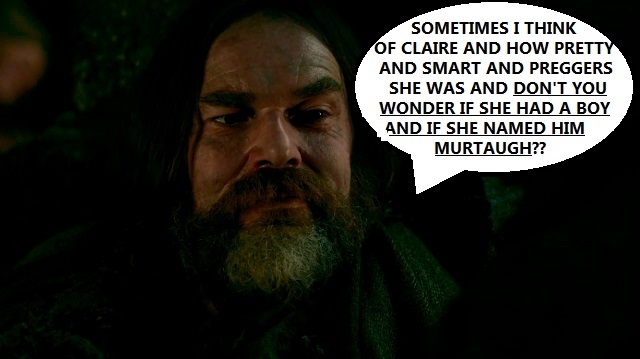 And of course he’s reminiscing about Claire and the wee bairn. Without Ian around, someone’s gotta play therapist to JAMMF. 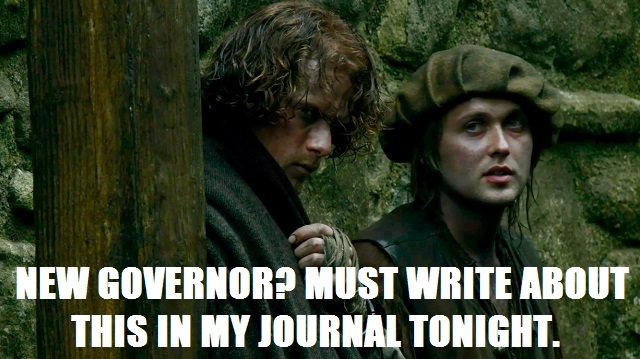 That JAMMF is a hard nut to crack. 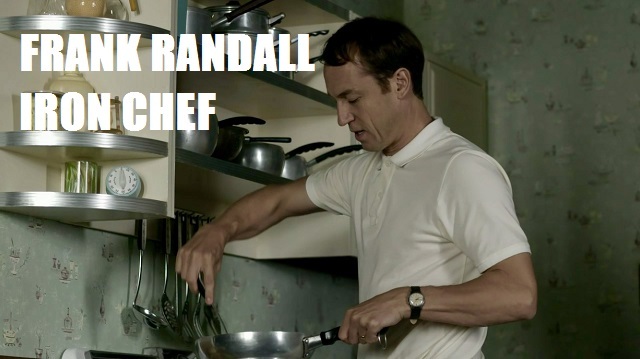 First, I was pleased as punch to see Frank cooking breakfast. Oh, how things have changed. Remember two weeks ago when Frank expected Claire to make him bacon and eggs every day? But then I wanted to punch Frank for telling Claire he’d already seen The Searchers and Carousel. Couldn’t he just pretend? Does he think he won’t be able to get through “June is Bustin’ Out All Over” without singing along? Then I really wanted to punch Frank for skipping out on his wife’s graduation party to go on a date. What’s so urgent that you can’t reschedule, Frank? Going to see The King and I? This is one night. Be cool. Here’s Sandy Candy thinking she’s meeting her boyfriend for a big night at the movies, probably wondering if they’ll get just popcorn or splurge for popcorn AND Jujubes, and Dr. Claire Medicine Woman answers the door. Awkward! Yes, Claire saying goodbye to dead Frank was heartbreaking, but the real Kleenex moment for me was seeing JAMMF and Murtaugh torn apart—again. They don’t even have a chance to say goodbye! 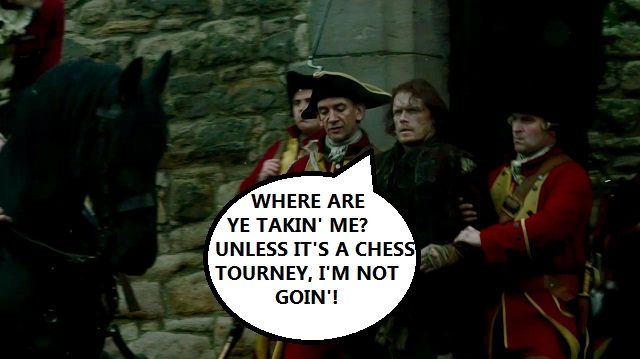 JAMMF gets dragged off on a rope and Murtaugh’s probably wondering where his precious godson is going, and Murtaugh’s heading off to the colonies, and they can’t even text because it’s the 18th century! I’m sorry. 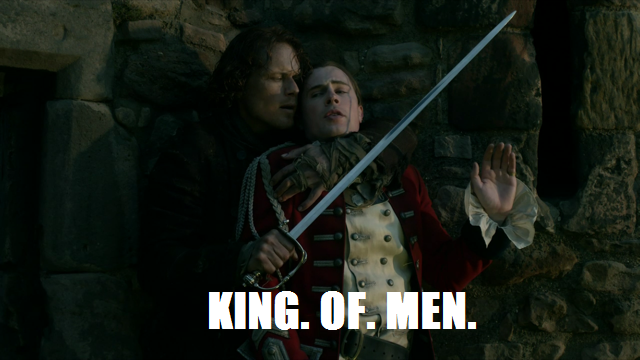 This is one week when I can’t pick a hottest JAMMF. There are way too many hot JAMMFs in this episode. 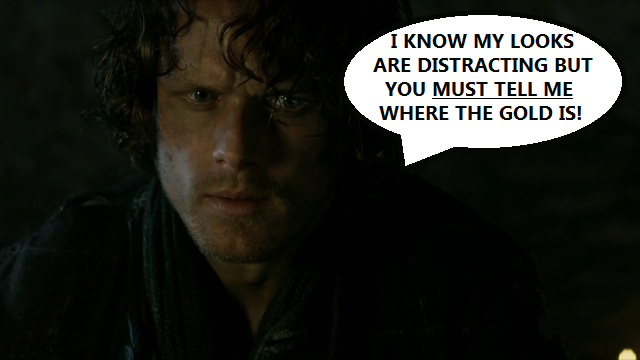 There’s “Brooding in the corner” JAMMF. And there’s also “Help my kinsman get medicine” JAMMF, whose perfectly tousled hair and ideal-length scruff undoubtedly have some sway. Then there’s “Listening to this crazy old coot talk about gold and white witches” JAMMF. 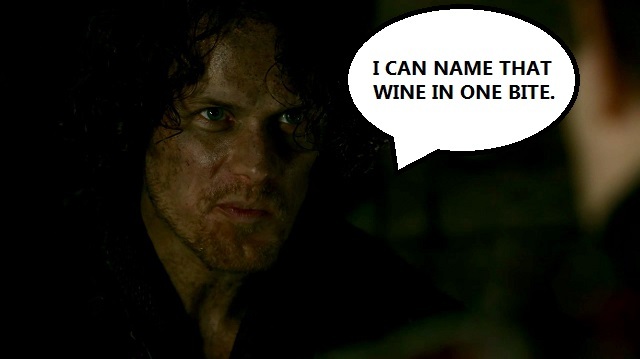 And don’t forget about “Feasting on pheasant” JAMMF. Which of course leads to “MAN, you know your wines” Lord John. 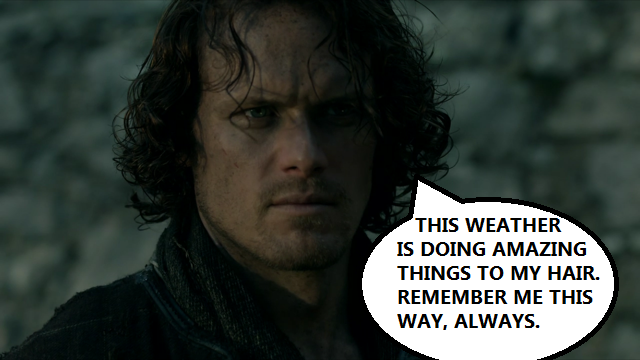 And sure, Yummy Faces JAMMF is beautiful, but what about “THIS IS HOW IT’S DONE” JAMMF? But wait, there’s more! 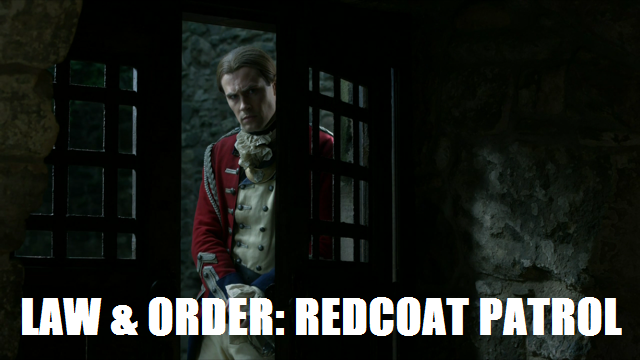 If you order now, you’ll also get “Please kill me” JAMMF. 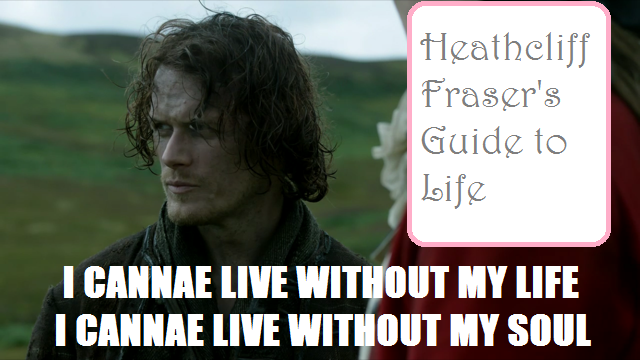 AND, as an added bonus, “Thinking about Claire” JAMMF, who looks and feels a lot like Heathcliff to me. And last but not least, there’s “Mentioning Claire” JAMMF, because that wee smile is enough to keep me going until next week’s episode. 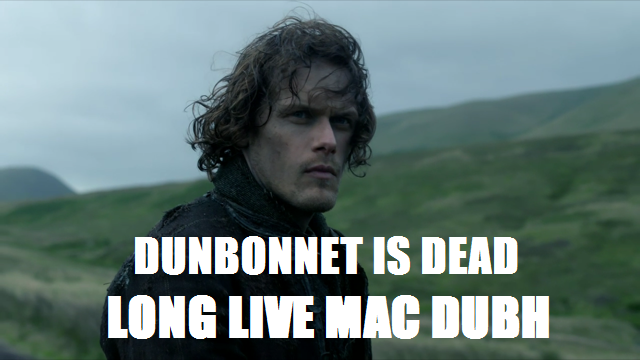 So, what say you, Mac Dubh lovers? Were you elated to see Murtaugh? Did you cry over Frank? 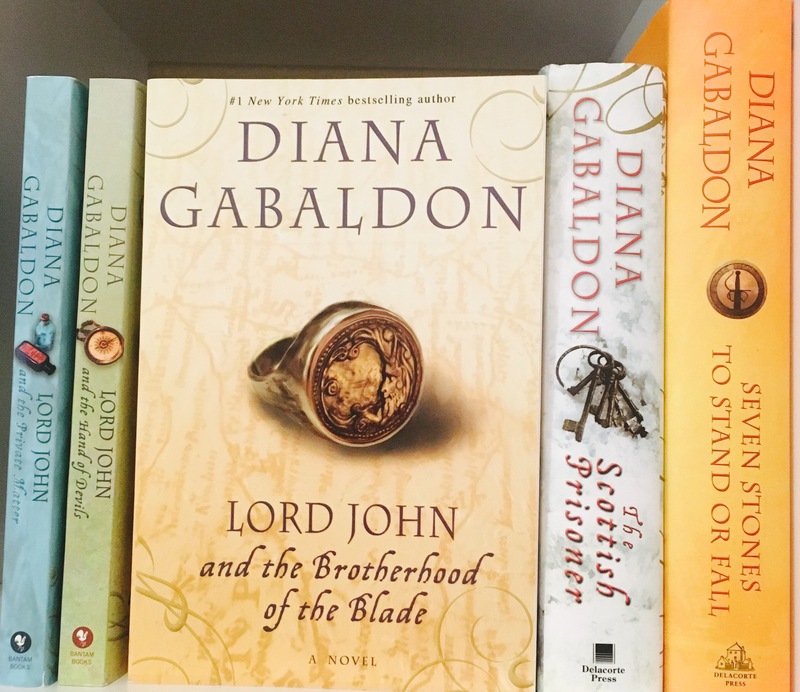 Are you joining the Lord John Fan Club? And can you wait until the weekend to find out what’s about to go down at Helwater??? Probably nothing too eventful, right? I hear those Dunsanys have a lovely daughter named Geneva. I wonder what she’s like?